Valentine's Day is coming up! Are you prepared? Do you have new gift ideas? 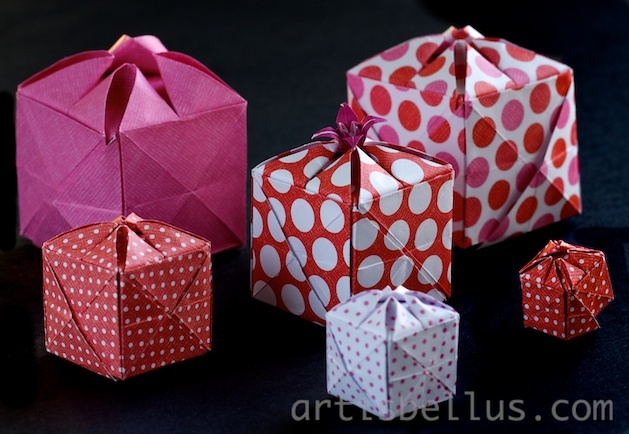 What about wrapping a special Valentine's Day gift inside these cute Flowery Boxes? The Flowery Box is one of my earliest creations. It starts with the same base as the Wildflower model. 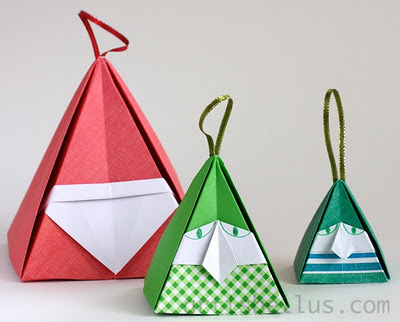 It can be folded into different sizes and then nested inside each other, as shown in the video instructions. It's recommended to fold the boxes with a paper that is stiffer than regular origami paper. 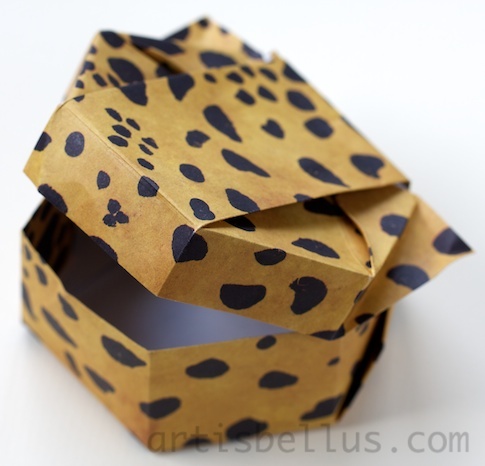 Tant paper or scrapbook paper will work well. I folded the nested boxes with 12", 10", 8", 6" and 4" (300, 250, 200, 150 and 100 mm) squares of scrapbook paper. 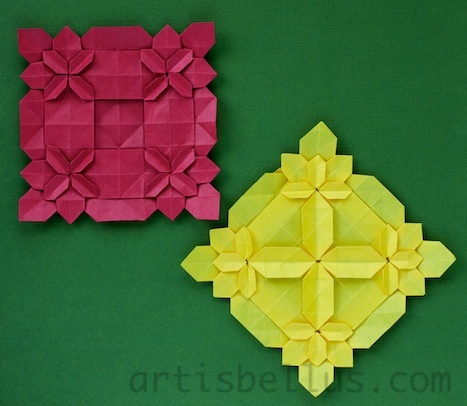 The tiny flower, inside the smaller box in the video and on top of the center box in the picture, is a traditional Lily, folded from a 1 ½" (38 mm) square of regular origami paper. I hope you like the idea and Happy Valentine! 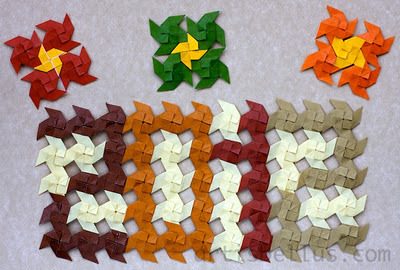 Recently, I've been folding hydrangea tessellations from the book, Ajusai Ori -Folding Origami Hydrangeas, by Shuzo Fujimoto, ISBN 9784416310410 (in Japanese). The book is full of his beautiful hydrangea, clover, and butterfly tessellations, in several different arrangements. There's a lot of precreasing involved. Both tessellations in the picture start by folding a 16 x 16 square grid, and then all the diagonals in the grid. I have yet to attempt folding the models that start with larger grids. I folded the models in the picture with 9" (225 mm) squares of Pacon Paper Squares , a very thin and strong paper, perfect for these models. Very easy to fold and absolutely fun to play with, these spinning tops are a great project to amuse children and grown ups too (why not?) in a rainy day. The "two piece blowtop spinner" (bottom left) was created by Taichiro Hasegawa, and the "three piece finger activated spinner" variation (bottom right) is from an unknown creator. 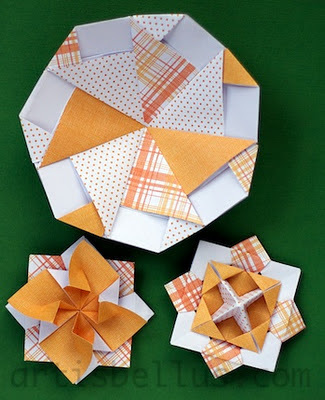 The instructions to fold them can be downloaded here. Tip: If you are using paper that is white on one side, fold both pieces of the two piece spinner starting with the color side up. For the three piece spinner, fold the base starting with either side up, but fold the knob-holder and the knob starting with the white side up. The "jumbo unit spinning top" (big one at the top) was created by Kunihiko Kasahara. It is folded with 7 pieces of paper. 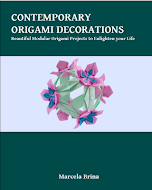 The folding instructions can be found in the book Origami Omnibus: Paper Folding for Everybody, and also in the book The Art and Wonder of Origami . In total, I used 3 sheets of 12" (300 mm) scrapbook paper, that I cut into 6"(150mm) squares. That gave me the 12 squares needed for the three spinners.